The next time you're sauntering around the Pearl District on first Thursday take some time to wander a little more expansively. Walk through the Baghdad-esque art bazaar that spontaneously occurs near 13th Ave. Explore the proliferation of self start-ups and oblique instant galleries that spring to life once a month in China town. What do you have to lose? Your worst-case scenario is that you hike up more flights of stairs, see a little more decorative living room cubism, and drink a little more wine than usual. But without daring exploration, where would we be today? Without Magellan, would the rest of society ever have guessed the globe was circumnavigable? Without Galileo would we ever have admitted the solar system was heliocentric? Without Lewis and Clark would Oregon ever even have been discovered? Check out one of the best self start-ups in China Town, the Starling gallery, managed by David Stein and Suniti Dernovsek. These two young people make great contributions to the PDX arts community through pure moxie. In addition to creating a unique forum for the visual arts, Suniti is active as a dancer/ choreographer. Upon entering the Starling, You will find an energetic youth driven atmosphere that is as conversant in the high culture of art as it is in the low culture of DIY post-punk democratic community. This is an excellent arena for the artwork of Lisa Beyer. Beyer's new work engages a specific cultural subset that if not for the start-up chutzpah of the Starling, would otherwise be eclipsed in the lunar shadow of wine and cheese cast by the pearl. Beyer's show, entitled, It's Ugly, but is it Art? is an interchange between several socio-cultural contexts. The work is rooted in DIY street community and music, but infiltrates fine art as well as commodity culture. Each of these fields have specific limitations, and it is exciting to see such an interaction taking place. Street community values bring a freshness to art production which the art world at large is only beginning to recognize. Skateboarder and graffiti culture have replaced rural communities as the primary arena in which outsider artists get their training, although it must be noted there are many problems with the very idea of outsider art. Art schools now produce graffiti artists, and the academic impulse to constantly identify and sell new forms of outsider art is something to be mistrusted. Despite debates about the purity of graffiti, many artists comfortably walk the line between fine art and street culture, and can be found alternately installing work in museums and bombing freight cars. Of these hybrids, two of the most notable are Barry McGee (the legendary Twist), and Margaret Kilgallen. Link to articles here: Twist, Kilgallen. And of course, who hasn't seen the work of Shepard Fairey? You might not know the name, but at some point you have seen the ubiquitous black and white image of Andre the Giant's face with the word "Obey" underneath it. Beginning by single-handedly pasting up black and white posters, Shepard Fairey's campaign spread to become national propaganda. This propaganda seems to have no clear message beyond expressing its own power to communicate. The Andre the Giant has a Posse movement became iconic, and Fairey received attention from the art world and was approached by clothing corporations which wanted to market the imagery. As a fine artist, a graffiti artist, and an entrepreneur, Fairey seems to embody dissonant roles. In his own words: "I sometimes feel like a double agent." See this link for a full article: Shepard Fairey. This is not just contemporary art; it's right-now art. It's a collection of images and objects that help to define a culture. It's a way of life, an ideology, a new religion. It's a roar from the dark streets. It's shotgun art. It's a single weathered graffito on a peeling tenement block in the city. For the complete curatorial mission statement, link here: Beautiful Losers. Artists have always been attracted to tools that work cheaply and instantaneously, like the Polaroid camera, or that holy grail of thrift stores, the Pixelvision. The Pixelvision was a video camera made as a toy that recorded sound and images onto audiotapes. In production for only two years, its impact on the 1987 video art scene was profound. For more information link here: Pixelvision. Lisa Beyer's artwork is based around a related technology that because of its immediacy has evolved into an art form. This is the mixtape, which since 1963 has existed as a personal form of aural, curatorial expression. This form of expression is low-fi and intimate, it communicates directly between two people. It speaks to the common experiences of friendship, and means little outside of that context. The mixtape (and now the mixcd) has become an emotional translator, a touchstone for memory, a landmark of significant interpersonal events in modern life. We compile songs which express how we feel when we're falling in love or breaking up. We compile songs as pictures of our emotional lives. For the complete history of the mixtape link here: Mixtape. The Pantyhose Animals are like the essence of the person as I see them, perhaps a visual interpretation of their personality or even of my experience with them. Music is a means to get to the essence. This is my perception of them through music; a response: stripped down, throwing to the wind all of the unnecessary we carry each day. Focus on the warm feelings. Like art itself. 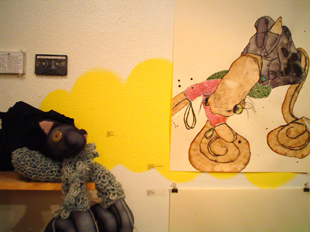 When I make a Pantyhose Animal, I am with the person and my memories of them. They are constructed of human materials: pantyhose, stuffing, soft yarns â€“ human friendly materials soft and warm and easy. These Animals are made of the memories, beautiful ones that bring smiles of all varieties to my face, from gentle musing, the kind of smiles which are not easily removed. Sometimes to know someone is a gift, closeness is often hard to maintain and always difficult to achieve. What I have learned: closeness is a thing to be respected, human interaction a delicate thing. Pay tribute. 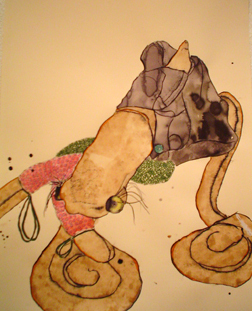 After making the stuffed animals, Beyer poses them and creates watercolor and ink drawings of them. Beyer reveals the entirety of her process, displaying the mixtape, the song list, the stuffed animal and the drawing in the gallery. Beyer herself seems uncertain as to whether or not she is making art, and poses this question to the viewer in the title of her show: It's Ugly, but is it Art? Perhaps she considers only the drawings as fine art, and the rest of the objects as a support system. The stuffed animals seem easily more related to commodity culture. They are cute and desirable and could easily be a stranger and more abstract lineage of Care Bears. Wooden boards on the floor of the gallery display piles of candy, and counterpoint the work itself. This adds an element of pure, unmitigated, unrestrained and senseless celebration which opens a window to the rest of the work. Beyer doesn't care if it is art or not. She just wants you to feel good, the way she feels with her friends. The Beautiful Losers curatorial statement serves as a defense of Beyer's work as fine art. This is real culture. This is right-now art. This is a collection of objects which make up a way of living. It's Ugly, But is it Art?